FORT MYERS, Fla. – Hailed as a steal in the third round of last year’s draft, catcher Austin Rei hardly lived up to expectations in his first taste of professional baseball. The .179 batting average in his initial stint with the organization quickly tempered some of the excitement around his selection. However, Rei is not running away from that poor performance, but is ready to put it firmly in his past, starting with a change he made to his hitting mechanics. “Obviously, I want to redeem myself for the terrible offensive half-season I had last year,” Rei said plainly following a minor league spring training game. One reason for optimism is the change Rei made to his hitting mechanics this offseason, removing a leg kick that he began utilizing in college. While the new scale is fairly analogous to the previous scale in certain areas, there are some clarifications, as well as significant changes at grades 4.5 and below. For example, a grade "4" is now an Emergency Up and Down Player, a grade "3" is an "Org Player" who contributes at Double-A or Triple-A, and a grade "2" will be a player who struggles to advance past A-Ball. Additionally, we added a grade "4.5" on the scale. Many professional scouts use the terminology 4Yes/4No or some other secondary indicator to differentiate between bench players and emergency players. We will be using 4.5 to make that differentiation. However, we will not be using a ".5" between other grades on the scale. As was the case previously, an abbreviated explanation of the scale will be shown in a red box in the left-hand column of the rankings pages, and the full explanation of the Scale, with details as shown in the above image, will live on the About Us page. Additionally, we will continue using three numbers on the rankings pages: a "most likely MLB projection," a floor, and a realistic ceiling. Note that the player rankings will not necessarily always directly correspond to the projection grades, as we will also be factoring in floor, ceiling, and risk factor into rankings. All prospect grades on the home page have been updated in connection with the launch of the new Scale. Watch for more updates when the initial 2016 season rankings are published around April 7. We may still be in the process of tightening up grades in the coming week. In this week's edition of the SoxProspects.com podcast, the guys reflect on their trip to Red Sox camp and break down the recent changes to the SoxProspects.com rankings. 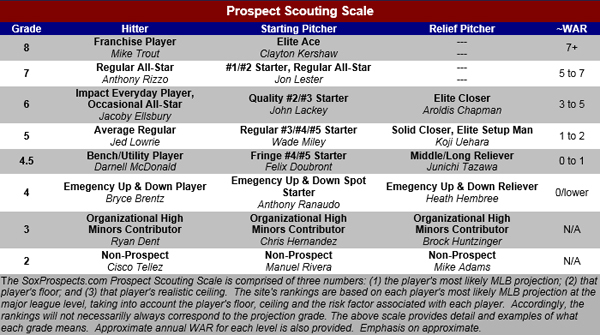 Speaking of which, the SoxProspects.com prospect rankings have been updated for the new season and you can read some of the discussion that went into the revamped list, courtesy of Will Woodward. SoxProspects.com's own Matt Huegel wrote a fascinating story about the amateur career and recent development of Austin Glorius. 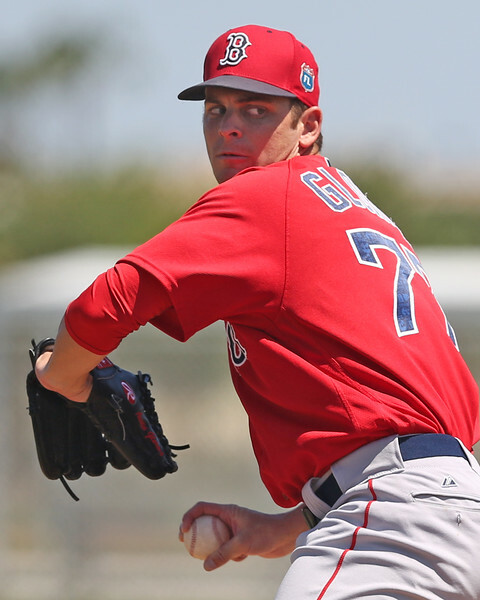 Signed as an undrafted free agent in 2015, Glorius showed a live arm and pitched well in Short-Season A Lowell down the stretch, positioning himself as a potential breakout prospect heading into the season. 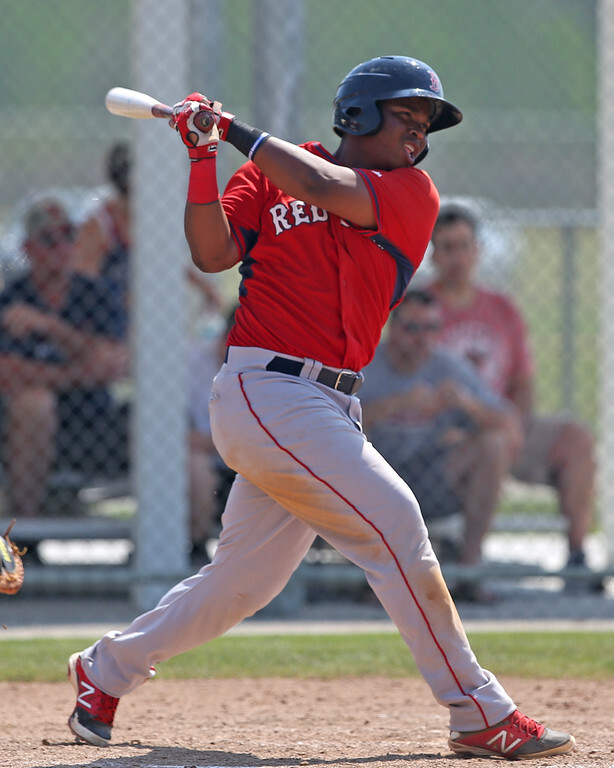 Second-ranked prospect Rafael Devers (pictured) and 13th-ranked Mauricio Dubon both started for the big club in Saturday's loss to the Orioles. Both prospects had 2-for-4 days at the plate, with Dubon also chipping in with a two-run single. 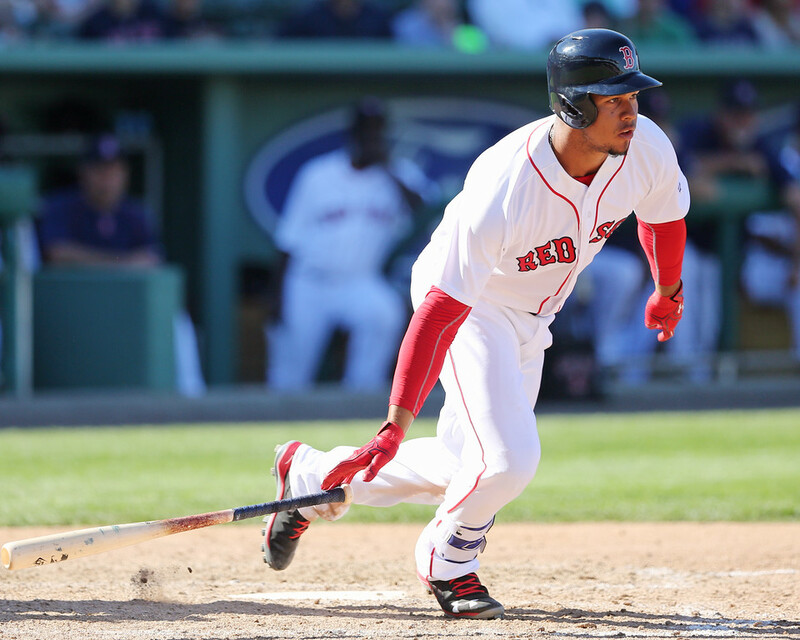 On Devers, Red Sox manager John Farrell stated, "For a player that age, he's got a lot of good things going for him." FORT MYERS, Fla. -- When the SoxProspects.com staff got together in Fort Myers over the past week, one of the goals was to take an in-depth look at the rankings and overhaul them as necessary. It turned out to be a much more detailed and lengthy process than expected. 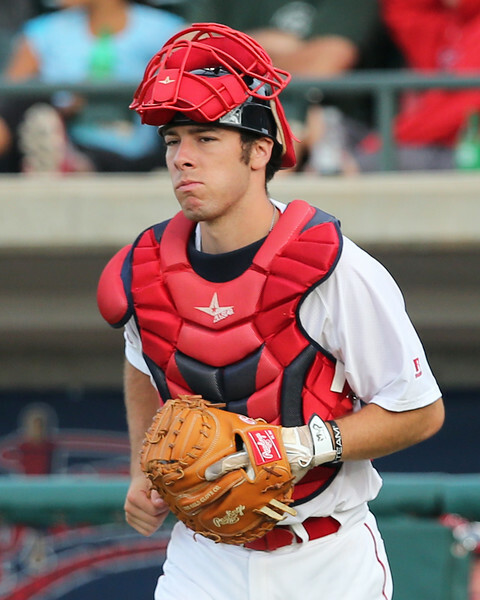 The complete SoxProspects.com rankings can be found split between the top 20 and the prospects ranked 21-60. Below is a notebook of some of the debates, discussions, tiers, and insight into the rankings process that occurred over the course of the afternoon of Saturday, March 19 in Room 321. The plan was to start at the top of the rankings and work our way down. Right out of the gate, we all agreed that there is a clear top 4 prospects and that Yoan Moncada still deserves to top the rankings. The only other discussion on the top four was whether 18-year-old Anderson Espinoza (pictured, right) deserved to jump third baseman Rafael Devers, who currently ranks second. Espinoza looked extremely impressive in his first spring outing, as Chaz and Ian noted in their Notes from the Field. Ultimately, the fact that he spent almost the entire season in the GCL meant that he was so far away that he was best kept in the third spot for the time being. The next debate was whether anyone had passed righty Michael Kopech for the fifth spot in the rankings. Despite being a level below the top four, he still has impressive talent and upside that tops anyone else in the system at this time. Another successful trip to minor league spring is in the books for the SoxProspects.com crew. With fresh scouting and other intel to share, Chris, Matt, Ian, and Chaz got on the horn to talk about what they saw, as well as the All-New, All-Different SoxProspects Rankings! How did the big four of Yoan Moncada, Rafael Devers, Anderson Espinoza, and Andrew Benintendi look? What led to big jumps in the standings from Travis Lakins, Christopher Acosta, and Luis Alejandro "Not Just the Other" Basabe? Why has Yankory Pimentel made Chaz rethink everything he knows about scouting? All of this and more await in this episode. FORT MYERS, Fla. -- Austin Glorius found himself undrafted after 40 rounds of the MLB draft had played out last June, but since striking out the side in his first professional appearance while pumping heat, he has begun to garner more and more attention as a rising prospect. That first appearance he went just the one scoreless inning in relief, but afterwards he moved into a starter’s role. In all, he made seven appearances, five starts, striking out 36 in 26 2/3 innings while walking 13, finishing with a 2.70 ERA. Along the way, he impressed many scouts, including the SoxProspects.com scouting staff, who were not expecting to that kind of a live arm out of an undrafted free agent. In the most recent episode of the SoxProspects.com podcast, Chris Hatfield, Matt Huegel, and Ian Cundall dug through a pre-camp mailbag and answered a number of your questions about the state of the farm. This week marked the annual SoxProspects.com scouting trip as Ian Cundall, Chaz Fiorino and the rest of the gang headed down to Red Sox spring training. On Wednesday, the guys headed to Port Charlotte to watch the High A and Low A teams take on the Rays. Then on Thursday, they stuck around Red Sox camp and took in High A and Low A games on the back fields of JetBlue Park. Their notes from the field include reports on Yoan Moncada, Anderson Espinoza, Luis Alexander Basabe, Michael Chavis, and more. The Red Sox have begun to trim their roster in earnest, cutting ten players from big league camp this week. 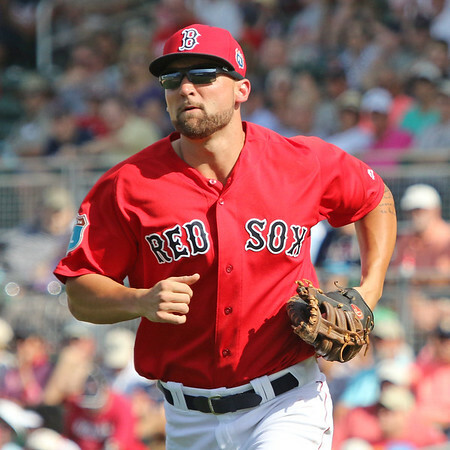 Over the course of the week, the Red Sox optioned outfielder Bryce Brentz, infielder Sean Coyle, left-handed pitcher Edwin Escobar, infielder Marco Hernandez, and right-handed pitcher Pat Light to Triple-A Pawtucket. 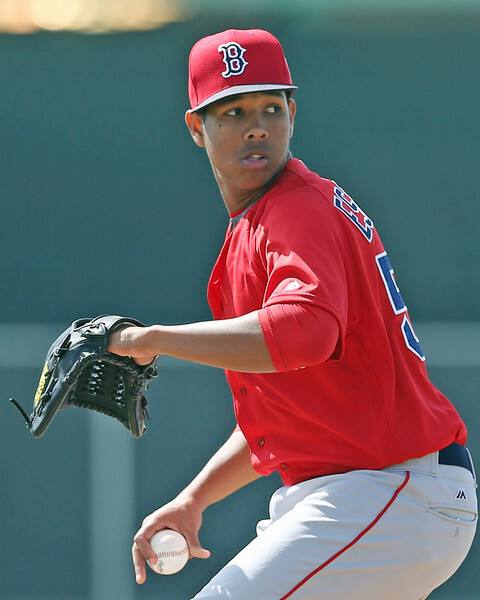 The Red Sox also optioned left-handed pitcher Williams Jerez to Double-A Portland and reassigned non-roster invitees infielder Chris Dominguez, right-handed pitcher Kyle Martin, right-handed pitcher Sean O’Sullivan, and catcher Ali Solis, to minor league camp. With these cuts, the Red Sox roster currently stands at 45 players, including 11 non-roster invitees. Just three days after sending down seven players from big league camp, the Red Sox have cut two more, optioning infielder Marco Hernandez (pictured) to Triple-A Pawtucket and reassigning right-handed pitcher Kyle Martin to minor league camp. Hernandez had an excellent showing in big league camp, going 11 for 19 (.579) and notching six doubles with a stolen base. Though Hernandez projects as a utility infielder, he has a chance to be successful in that role as he has shown the ability to play both shortstop and second base. He is coming off a strong offensive season between Portland and Pawtucket in which he batted .305/.330/.454 with nine home runs between the two levels. FORT MYERS, Fla. -- Both members of the SoxProspects.com Scouting Department, Ian Cundall and Chaz Fiorino, took in the High A and Low A games on the backfields of JetBlue Park. Here are their Notes from the Field. PORT CHARLOTTE, Fla. -- Both members of the SoxProspects.com Scouting Department, Ian Cundall and Chaz Fiorino, arrived in Fort Myers on Wednesday for the start of the annual site trip to minor league camp. With the High A and Low A clubs traveling to Port Charlotte to take on the Rays, the guys headed north too. Here are their Notes from the Field. - Yoan Moncada (pictured) started at second base and had four plate appearances from the left side. His first two at-bats of the day came against Rays starter Jake Odorizzi. In Moncada’s first at-bat he grounded out to shortstop on an 0-1 fastball away. In his next at-bat, he really battled and demonstrated good plate discipline and approach. Moncada saw a heavy dose of off-speed with a pitch sequence that went curveball, slider, changeup, changeup. With the count 2-2, Moncada fouled off a fastball and then took a fastball just away off the plate for a ball. With the count 3-2, Odorizzi went to his bread & butter changeup, and Moncada swung right over the top for a strikeout. 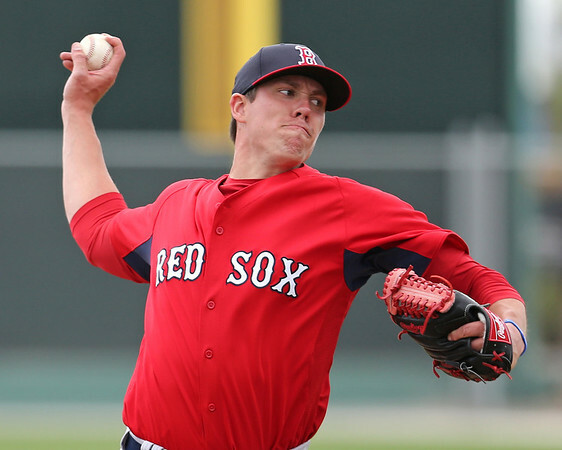 The Red Sox announced a round of cuts from major league camp Tuesday afternoon. Four players were optioned to Triple-A Pawtucket: outfielder Bryce Brentz, infielder Sean Coyle, left-handed pitcher Edwin Escobar, and right-handed pitcher Pat Light (pictured). Left-handed pitcher Williams Jerez was optioned to Double-A Portland while infielder Chris Dominguez and catcher Ali Solis were reassigned to minor league camp. Light didn't fare well in camp. The 24-year-old right-hander allowed 10 hits and three earned runs in 5 2/3 innings. Still, Light could develop into a bullpen staple with a fastball in the high-90s and a splitter that shows plus potential. After moving to a relief role in 2015, Light dominated in Double-A Portland but struggled in Triple-A. Jim Callis of MLB.com chatted with SoxProspects.com on the latest episode of the podcast. He discussed his recently released list of top 30 prospects in the Red Sox system. Just as he was starting to move past his 50-game drug suspension from last year, fifth-ranked prospect Michael Kopech is in hot water again. The right-hander broke his throwing hand after an altercation with a teammate, which was confirmed by General Manager Mike Hazen. Top-overall prospect Yoan Moncada started in a pair of major league games this week, a rare instance for a player not officially invited to big league camp. The 20-year-old Cuban went 0 for 2 against the Pirates on March 9 and 1 for 3 with a run scored against the Rays on March 13. According to the notes of SoxProspects.com Executive Editor Chris Hatfield, who has monitored lineups from the past two years of spring training, no player from minor league camp has started more than one major league game in a single spring during that time. The last minor league player not invited to big league camp to make a start for the parent club was outfielder Henry Ramos, who did so once in both 2014 and 2015. However, bus rides, split-squad games, and injuries to major league players were involved in both instances. Several members of the Red Sox roster and staff said they were impressed with Moncada's size, speed and defense. Joe Kelly was especially effusive about Moncada, telling members of the media he looks like an "inside linebacker for the San Diego Chargers." Right-handed pitcher Michael Kopech (pictured, right) fractured his throwing hand in an altercation with a teammate. Rob Bradford of WEEI.com was the first to report the injury, which has since been confirmed by General Manager Mike Hazen in a statement to the media. 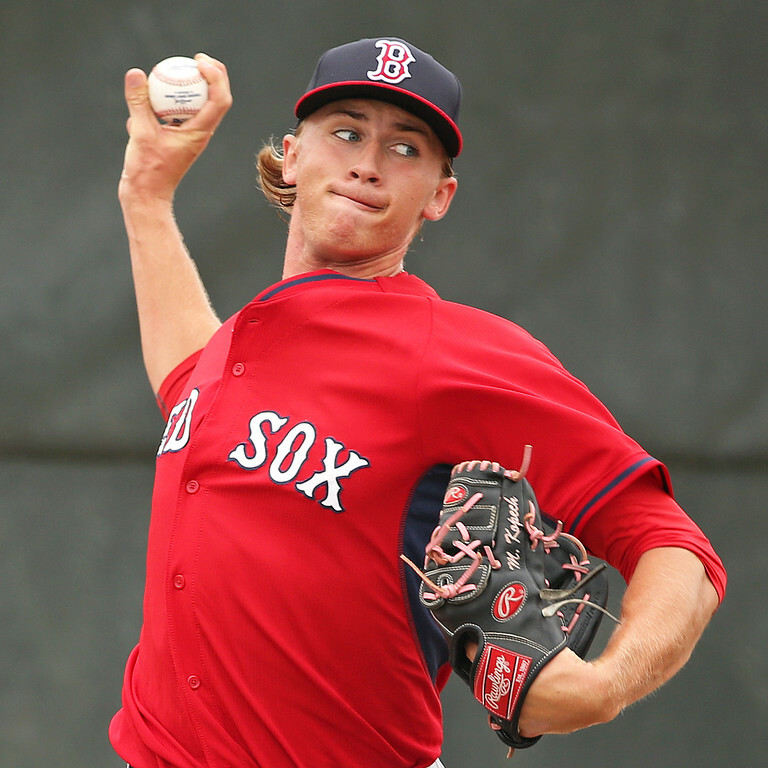 Kopech entered the season as the fifth-ranked prospect in the SoxProspects.com rankings. This is the second off-field incident for Kopech in the past year. His season was cut short in 2015 when he was suspended 50 games for a violation of the Minor League Drug Prevention and Treatment Program after testing positive for the stimulant Oxilofrine. He completed that suspension at the end of the season and was able to participate in the Fall Instructional League, showing the promise that made him such a highly rated prospect. 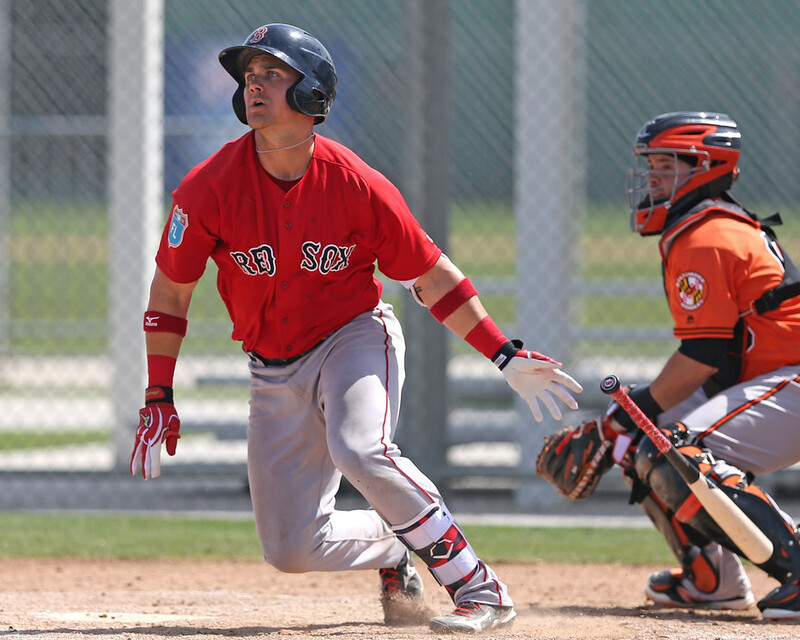 With the SoxProspects crew about two weeks away from being down in Fort Myers, Chris, Ian, and Matt spoke with Peter Abraham of the Boston Globe about some of the young players who have caught his eye so far in spring training. Sam Travis (pictured) and Yoan Moncada were two of the players who Abraham spoke very highly of on the most recent episode of the Podcast. The Red Sox announced that they signed David Murphy to a minor league contract last week. Murphy was Boston's first-round pick back in 2003, and he was dealt to the Rangers as part of the Eric Gagne deal in 2007. Murphy hit .283 over 132 games with the Indians and Angels last year, and he has a March 27 opt-out date. Peter Abraham of the Boston Globe has been all over coverage of the early stages of spring training, and he joined us for a conversation about all the goings on! What minor leaguers have already caught Pete's eye? How much work has Yoan Moncada been doing with the major leaguers? Are there really competitions for spots in the rotation and the back of the bullpen? Plus, Peter had a great story about his introduction to covering minor league baseball.